Fill the boots of this forgetful hero and unlock the secrets of his scattered past as you venture through distant lands in an effort to recover, your memories! Throughout your journey, you'll come across devilish foes that stand in your way and meet unexpected allies to aid you in your journey. Want to name your own NPC and give it a backstory? Go for it I say! Simply type in the first name of your NPC, specify a gender and either give a topic for a backstory to be created or go ahead and create your own backstory for the character (that falls within the fantasy theme of this game). 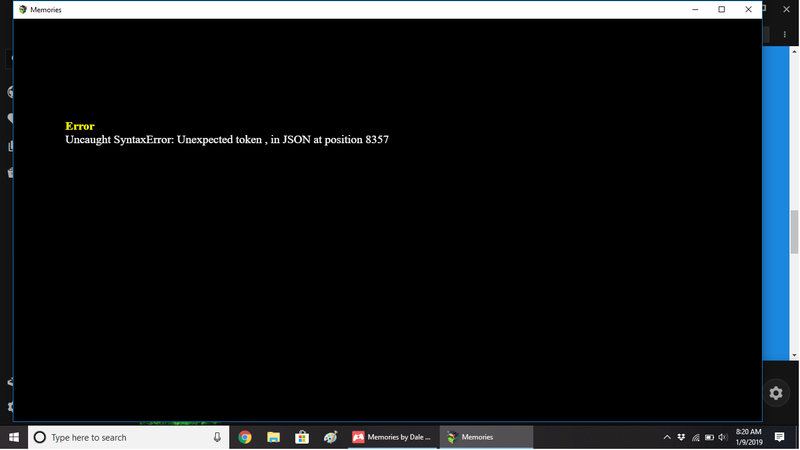 Uncaught SyntaxError: Unexpected token } in JSON at position 8189"
The same thing happens every time I try loading the game. Hi Iysana, I asked Duke (a tester on the Memories Discord server) to see if he could replicate your problem but neither of us could unfortunately. I'm hoping the new release I've recently uploaded will help with your issue but if not, let me know. That's weird that you couldn't reproduce it. Thanks for looking into it! I noticed from your screenshot, you downloaded the game using the itch.io app. Can you see if downloading it from the website makes any difference please? 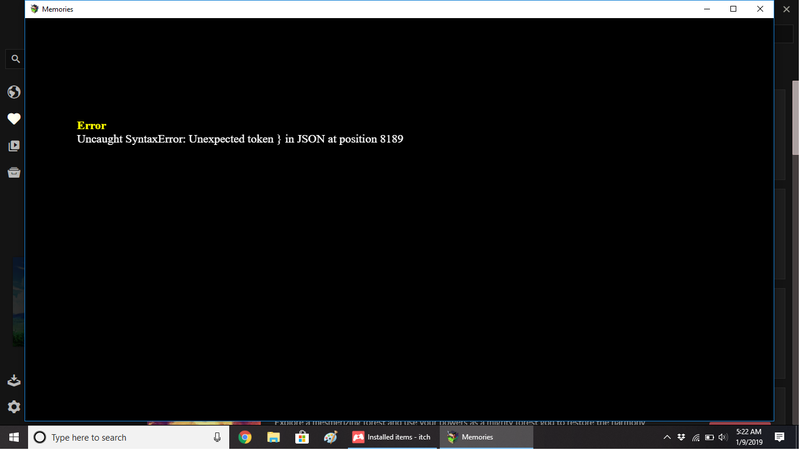 If it doesn't, please press F12 (i think, if not, try F8), it should bring up a console showing more details about the error. Can you screenshot that for me? If you'd like to join the Memories Discord server, please click the link below. There, you can view developer updates (similar to devlogs), view announcements for the game and report any bugs found during your play session. Most of all, you can also play early test versions of major releases and tell me your suggestions/ideas! It's occurred to me that not everyone might know how to transfer their save file from an older version of Memories to a newer version. With this being said, I've created a small video showing how to do this. Please be aware that in some cases (where features may be added/removed), it likely won't be ideal to transfer your save file and would be easier to start from scratch. Whenever this is the case, I will let you know in the Devlog.